Thank you Arun and Jerin for this wonderful opportunity! NewzHook has always amazed me for driving a web-accessible online portal. Thank you Gayatri and Ramya. This strength will help you persevere through the rough patches of life and face each challenge as an invitation to learn. Sensed a great joy to be part of this fundraising event hosted by Compassionate Hearts Network to support and empower www.deepticentre.com Adoor, Kerala. Thank you to the Indian community in Boston for making me feel comfortable and meeting a few of you in person whom I was in touch through online all this while was a complete joyride. Thank you for inviting me, It was also a great moment for me to share my insights on how I whirl with my life and spread awareness. I believe what we truly treasure cannot be measured and connecting with you both Sindhu chechi and Santhosh yettan is one of the same. Let her go and she shall fly! Thanks for all the sweet gestures shown towards me. I believe every single day is ours and a better tomorrow comes only when we have the willingness to be the change makers! After all, we’re all more than what we’re told we are. Let’s gracefully embrace our scars and dare to break barriers and build together inclusive societies for all! Here is the digital copy of the feature that was published on March edition Vanitha magazine. Music has been my dearest friend and healer. I vividly remember the days I used to lie on my bed feeling the pain of my broken bones being caressed by the soulful music of A.R. Rahman. I used to wonder if it’s too high an expectation to dream of attending his live concert one day. Time proved me to be lucky and I finally got a chance to experience a live concert by the mastero. To say the least about the concert, I was awestruck. Full moon just above my head, Bangalore’s cold breeze and the magic of the Oscar-winner’s mesmerizing fingers on the keyboard accompanied by other top artists stole my heart. Earlier I had shared one of the best moment (video) that had happened to me at India Inclusion Summit. There were a few priceless moments as well but my mobile lens failed to capture. However, Here are some of the beautiful moments captured (mobile clicks hence clarity isn’t great). But I believe it’s the people and those moments that make it priceless more than any pixel! I thank media Mathrubhumi, Asianet News and Manorama Online for featuring my story of the great honour I received recently. As we lack in awareness about the genetic disease I believe these stories will help in creating a change in #India at least in a small way. Had a wonderful experience at @schneiderelectric on the inclusion of persons with disability. I was able to connect with many and hear some inspiring stories. With the grace of God, I’m glad to share on the #internationaldisabilityday I have received National Award for Department of Empowerment of Persons with Disabilities, MSJE , 2018 (Role Model Category) by Ministry of Ministry of Social Justice and Empowerment, Government of India. The Award was conferred by Honourable Vice President of India Shri M Venkaiah Naidu. Though I feel immense joy in receiving the award, what made my day special is the love of these wonderful souls who joined me at the award function. I feel privileged to receive such love and warmth from each one of you. I am glad we managed to capture the moment into this frame. 💕 and gratitude. Thank you Barkha and team for inviting me to ‘We The Women‘ event. It was a pleasure, being part of it with such wonderful people. I feel extremely happy that I got an opportunity to speak about the rare diseases to a wider audience from various parts of our country and abroad. It’s been four long years I have been waiting for this moment…! Struggles and challenges have always been my asset. But Like how I always believe in that special power. With gratitude, the mighty strength always gave me the best of best moments in my life. Before the day ends, let me share the joy! The fun-fun moment photographs I shall share in the following days. Music always plays a major role in my life, I do not think I would ignore my love for these two songs even after my death (film song) Kalippattamayi Kanmani and Malargal Kaettaen. 😀 Whoo…hoooo!!!! Today after a looooooooooong wait, it happened! India Inclusion Summit became that special platform for my desire come true. Thank you, team,… #iis2018 for the day to REMEMBER! Here is an article, wonderfully written about me by Yesoda Bhargava (team Indian Osteogenesis Imperfecta Foundation IOIF). I wish to consider this Award as a tribute to my grandparents and all those beautiful souls who were born with the rare disease and is not among us. I wish to express my heartfelt gratitude to the Ministry of Social Justice and Empowerment, Government of India for nominating me. Thank you so much for taking time out to share this and support me on my mission of spreading awareness on rare diseases. You being an inspiration to many, I am sure this post would reach many and make them aware of conditions such as mine (osteogenesis imperfecta). I am humbled by your kindness and is always in appreciation of your good work. Wishing you all the best for spreading the light of wisdom. Thanks once again. I can see the dream of #InclusiveIndia is not far away. Glad to cover a story from Vaishali’s Art-Cart for Unique times online portal. Is your smartphone an idot box or smart gen gadget? Delighted to write another article for the www.thedaybreak.in newsletter. Sharing one of my shy full moment! 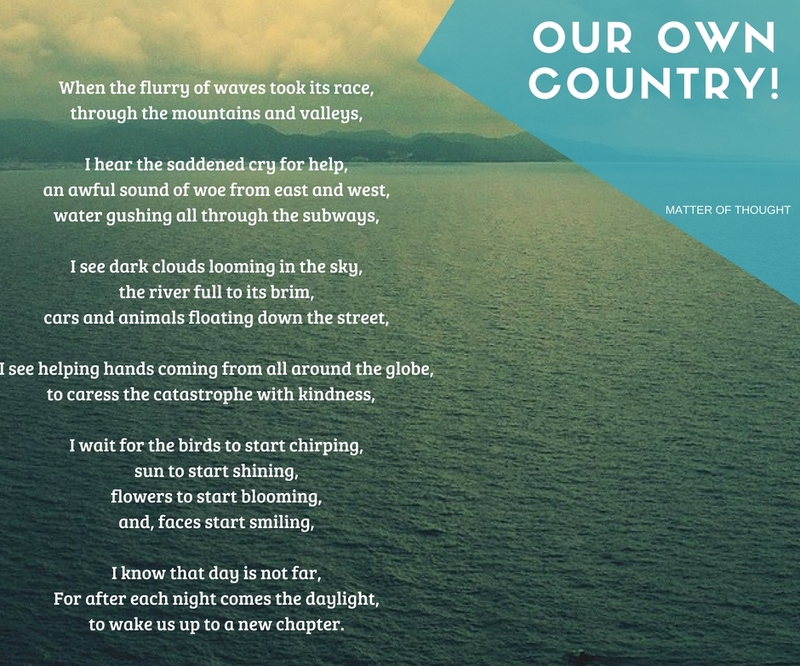 For the first time, I was part of YourQuote Open Mics and with all courage, I recited ‘Our Own Country’ poem. Words are never enough for the support I received from the Team and participates… Thank you! It’s almost like getting the moon on my palm! Super blessed to have had conquered this moment. I totally enjoyed being part of the #UnplugWithSadhguru program. Thanking the Sadhguru Ji, team Isha Foundation and IIM Bangalore for being so nice! Yes…marching out for more #inclusion!!!! I am sure most of you would agree with the saying because when my life throws a lot of strange situations, I had to sense every situation sensitively and it is between the situation and space I found the beauty of courage. Today I’m very much excited to see my good friend Archana taking that rare step of courage to start up an NGO called Indian-Osteogenesis-Imperfecta-Foundation. It is time for us to speak up, claim our rights and set ourselves free! Thank you so much team IOIF for the invite, it was lovely to meet few of them again and some the new faces too… Best wishes to the entire team of IOIF! Sharing one of the drawings gifted to me by Sanjay Kumar, who works at a private company in Palakkad, Kerala. I happened to meet him through Amrithavarshini Charitable Society. I have always seen Sanjay drawing celebrities photos, glad I became one of his choices to draw. Thank you for featuring about me Creative Cronies, it’s a pleasure to be on board with you Cheryl. Thank you team CADRRE for inviting me to the conference and for giving me the opportunity to talk about the “Love Of My Life” and my journey so far. As I mentioned before, such organisations and conferences, which are inclusive in nature, boost the confidence of people with disability and their family. I felt so humbled to meet so many wonderful souls from around the globe. I truly felt honored to have the gift crafted by the kids from #Cadrre. More power to you Vijaya Raghavan uncle! The staffs/volunteers, I need to say, you are perfect role models for today’s youth. The greatest freedom is the freedom, one gets to surround themselves with those who actually gives you the freedom to be what you are. Smileys. I went there primarily because I was keen to watch Prathap’s and Dinesh’s dance. Sometimes life goes beyond our plan and expectation. Apparently, I got the opportunity to meet Vishnu, #Vidhushi, Easwaran and Shanti mam. I always wanted to meet Shanti mam one day, because rarely one initiative to manage an NGO being inspired by their sibling. More power to all of you, thank you Mentor Kausalya for the support!!! Delighted to write a small piece of my belief for the www.thedaybreak.innewsletter. The 4th edition of BookstalkistMag is out. I thank team BookStalkist for giving me an opportunity to contribute a #poem of mine. As wishbone day is around the corner, Admin’s of Aamrithavarshini Charitable Society had planned a competition within the organization – among us (members). They had picked 8 members has leaders and each leader had to make a magazine by collecting stories/articles/art etc from their group members. So, this year I’m the leader for members at Trivandrum. FlY WITH US is the magazine I and my team members created. First time I’m doing something in a competitive spirit, it was interesting and challenging. Obviously with a lot of blunders too. Happy to say our magazine won three prizes. who help me with this magazine. Click to read the complete result. I am not the easiest one to get convinced. But yesterday I had no choice when I got to meet DQ, the one I adored and wished to meet all these years. Thank you Universe, you kept my trust intact. I have been complimented by many for my smile and positive energy, latest to the list was DQ himself. But little does he or these people know, I owe it to people like him who has healed me through their work. Nothing has helped me in my healing process as much as music and movies. And that’s why I fail to articulate my joy in meeting my favorite actor. Thank you so much, DQ chetta for taking out time to meet me. And I am grateful for the support you showed towards my mission of spreading awareness about Osteogenesis Imperfecta, through our NGO Amrithavarshini. TODAY GOD’S BLESSING WAS PUT-ON TO ME THIS WAY! My father accompanied me to BLF 2016 (Bangalore Literature Festival) today. I was excited to be able to hear ‘Premila Paul in conversation with Aishwaryaa Rajnikanth Dhanush‘. Personally, I’ve always been inspired by the way Aishwarya brings her larger than life stories to the common man. After all who doesn’t love listening to RajiniKath stories. Of course, I was little nervous and had the familiar butterflies wondering how she would be. Thanks to Viju chettan for making it all possible. As you already know how crazy I am when it comes to the people I adore. I just thought of sharing here one of the question I personally liked of which Premila Paul asked Aishwarya about an event where, Dhanush had said: “My wife is, even more, simpler than my father-in-law” and is it true? Aishwarya responded, He probably said so because he had to.. 😀 and she continued, that there is no one, in turn, to be as simple as her dad but we grew up seeing them (parents) and we just imbibed it. Their expressions and attitudes naturally extended into her. I believe the whole success story comes. When a child is able to accept and understand the limitations that get imposed on their relationship with their parent owing to their busy lifestyle and the parents, in turn, are sensitive to how the child is coping with the limelight. It was refreshing to see how relationships need not always fall victim to the trappings of luxury and amidst all the glitz and glamor, they managed to inspire creativity and free thinking in their daughters. An article featured about #Snehadeepam fundraising event organised for Deepti Special School and Rehabilitation Centre by #CHN on Manorama online http://bit.ly/2F9SAWE by Sindhu Chechi.